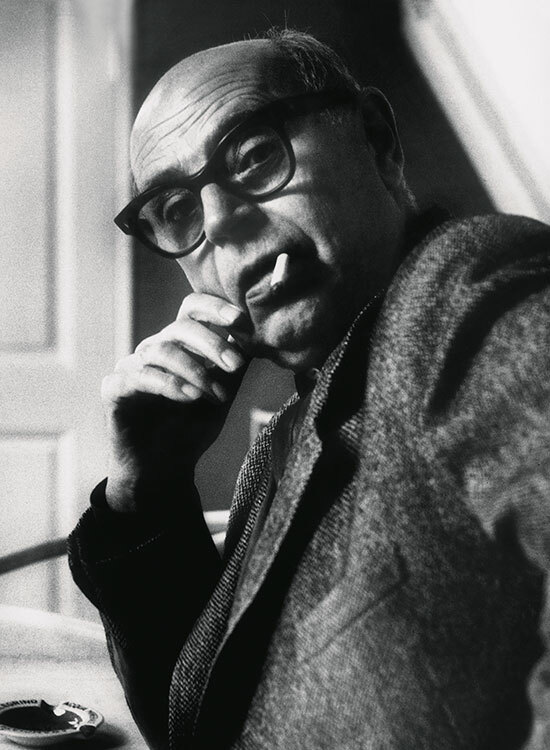 2019 will mark 125 years since the birth of Poul Henningsen (1894–1967). In addition to making his mark as a profoundly influential thinker, author, and cultural critic, Henningsen is celebrated in the world of design for his contributions to the art and science of illumination. 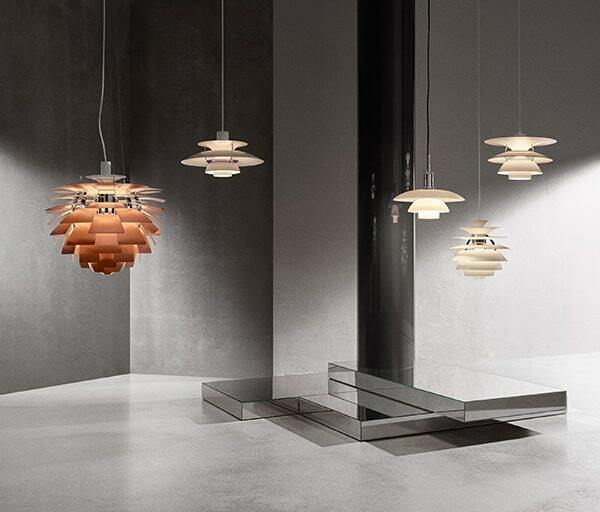 The PH Artichoke and the PH 5 are among his most renowned works, and Louis Poulsen is releasing new takes on these beloved classics to commemorate Henningsen’s 125th birthday. Henningsen’s lifelong collaboration with Louis Poulsen began in 1924, and the company continues to benefit from his genius to this day. Henningsen’s pioneering work with the relationship between light structures, shadows, glare, and color reproduction – and his fascination with “the good light” based on the human need for both darkness and light – remain the foundation of Louis Poulsen’s lighting philosophy. Henningsen’s iconic luminaires have inspired generations of designers to push the boundaries of form and technology to humanize light and spaces, indoors and out. Over the decades, Henningsen’s designs have proven their timeless appeal – and their ability to continually evolve through new editions and technological updates. The following new versions are a testament to the longevity of Henningsen’s industry-revolutionizing work. When Henningsen designed the iconic PH Artichoke for the Langelinie Pavillonen restaurant in Copenhagen in 1958, he opted for a copper construction and a rose finish on the leaves’ interiors. 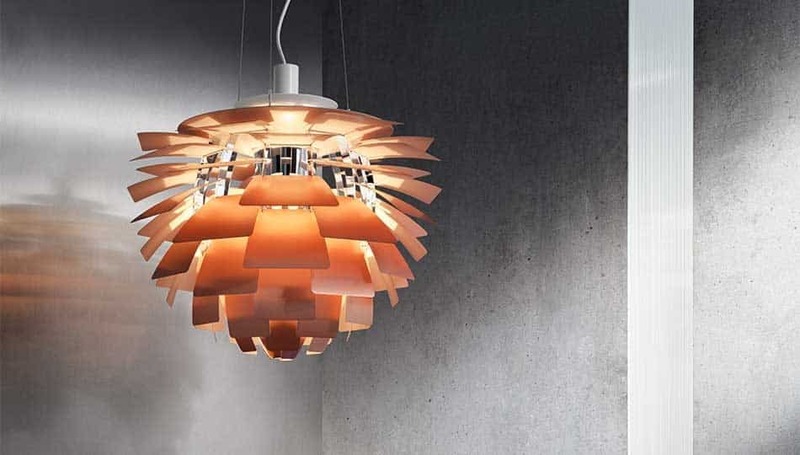 In honor of Henningsen’s birthday, Louis Poulsen is launching the PH Artichoke in this same, original pairing, known for its exceptional softness and warmth, in both its appearance and light output. The PH Artichoke is celebrated for its majestic, sculptural form, and its ability to instantly lend elegance and ambiance to a space, whether it is suspended above hotel and office lobbies, in restaurants and reception halls, or in private living and dining areas. Keeping the source of light hidden within its layers of leaves, the pendant creates soft, glare-free illumination. The PH Artichoke’s complex design and structure ensure that light breaks and filters evenly into the room. The copper/rose version will be available for sale exclusively in 2019 and will be offered in all PH Artichoke sizes. All special editions will feature an engraving alongside Henningsen’s signature to commemorate his 125th birthday. Today, six decades after its first unveiling, Poul Henningsen’s celebrated PH 5 remains a testament to the visionary nature of Henningsen’s work to shape light. To mark Henningsen’s 125th birthday, Louis Poulsen is releasing both the PH 5 and the PH 5 Mini in commemorative editions that pair brass shades with white tiers. This is the first time the PH is being crafted with a brass finish. This new edition joins the 2018 special editions that were launched in copper and white to celebrate the 60th anniversary of the PH 5. With their warm, mirror-like brass finish elegantly reflecting their surroundings, the pendants become a visually engaging, elegant, and sculptural addition to a room, whether they are turned on or off. The new golden tone fits beautifully into contemporary spaces, where the tendency is toward warm, organic hues. The brass edition is also an ideal companion to the copper PH 5 and PH 5 Mini. Together, the metallic hues create a dynamic interplay, enlivening any room. The result of Henningsen’s tireless mission to create the ultimate glare-free pendant, the PH 5 builds on his three-shade system for mostly downwardly-directed light. These commemorative editions of the PH 5 and PH 5 Mini will be available in stores starting February 2019. The profoundly influential and daring designer, author, and cultural critic Poul Henningsen left his mark on many areas of Danish thought and design, and built a legacy that remains integral to Louis Poulsen’s work to shape light. He studied at the Technical School in Frederiksberg, Denmark from 1911-1914, and then at the Technical College in Copenhagen from 1914-1917. He then began practicing traditional, functionalist architecture but grew increasingly interested in lighting design, which became his primary legacy. Having grown up in a small Danish town without electricity, Henningsen first saw electric light in 1907, and dedicated most of his life to taming and refining the then-new phenomenon. The designer’s longterm collaboration with Louis Poulsen began in 1924. In 1926, seeking to enhance the illumination of the day and combat its uncomfortable and unflattering glare, Henningsen developed his revolutionary three-shade system, achieving softly diffused lighting that was pleasing to the eye and created more comfortable and inviting spaces for work and life. Working closely with Louis Poulsen, Henningsen went on to give the world such classics as the PH 5, PH Artichoke, and PH Snowball, among many others. Over the course of his storied life, Henningsen also expanded his field of occupation into writing, becoming a journalist and an author. In fact, during his life, it was his literary talents and social criticism that won him celebrity in Copenhagen, where he also served as the head architect of the Tivoli Gardens amusement park in Copenhagen. Today, however, while history remembers his intellect, humor, and wide-reaching impact, Henningsen is best known worldwide for his human, aesthetic illumination, which continues to gain in popularity long after his passing. Founded in 1874, Danish lighting manufacturer Louis Poulsen creates products that encompass the duality of design and light. Every detail in the design has a purpose. Every design starts and ends with light. Louis Poulsen offers a range of lighting aimed at the commercial and domestic lighting markets, with lighting fixtures and solutions for both indoor and outdoor applications. In close partnership with designers and architects like Poul Henningsen, Arne Jacobsen, Verner Panton, Øivind Slaatto, Alfred Homann, Oki Sato, and GamFratesi, Louis Poulsen has established itself as one of the world’s key suppliers of architectural and decorative lighting and has a global presence with dedicated showrooms in Copenhagen, Stockholm, Miami, Oslo, Los Angeles, Tokyo, and Dusseldorf.